October 26 will be a busy day for tech fans as Microsoft's SmartGlass app hits as the Windows 8 hardware goes on sale. 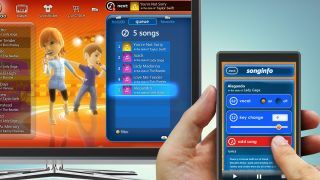 The free app transforms your tablet or phone into a second screen for the Xbox 360, and will be available on Windows 8 and Windows RT from October 26. It'll be coming to Windows 8 PCs, Windows RT tablets, Windows Phone 8 handsets and iOS and Android devices eventually, but iOS and Android users may face a wait of several months. SmartGlass will work with the new Xbox 360 dashboard (which is currently rolling out to all Xbox Live users) and offer web browsing as well as a place to track your gaming facts and figures. As well as the stat attack, SmartGlass actually allows you to use your tablet or phone as part of certain games – titles like Forza Horizon and Ascend have already integrated the external devices. SmartGlass can also act as a remote for when you're watching films through your console, streaming other content from the internet or using the newly-launched Xbox Music service.